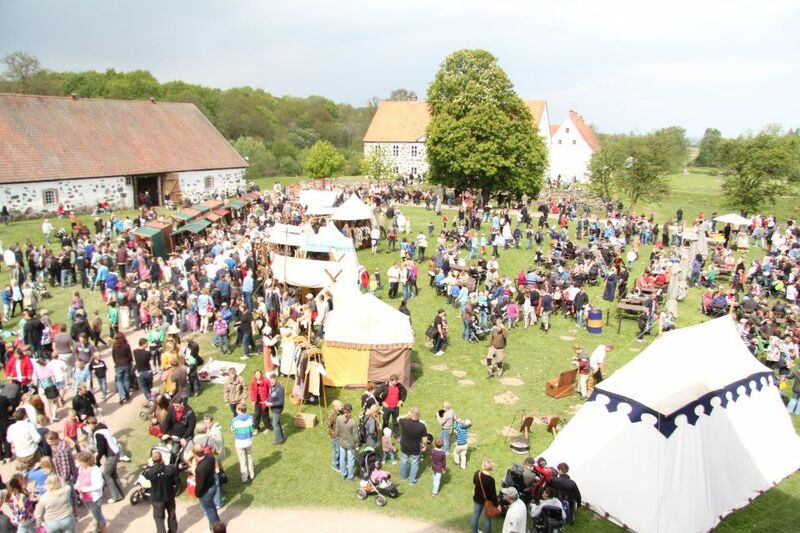 The 14th Official Swedish Championship Jousting Tournament, Rikstornering 2013, was held May 10 - 11 at Hovdala Slott(Castle) in Sweden. The jousting troupe Torneamentum (Facebook page for Torneamentum) was yet again the winning-most team, though the competition was closer this year than it has been in previous years. In Sweden there is a strong tradition to create associations, groups or organizations for people who share a common interest. 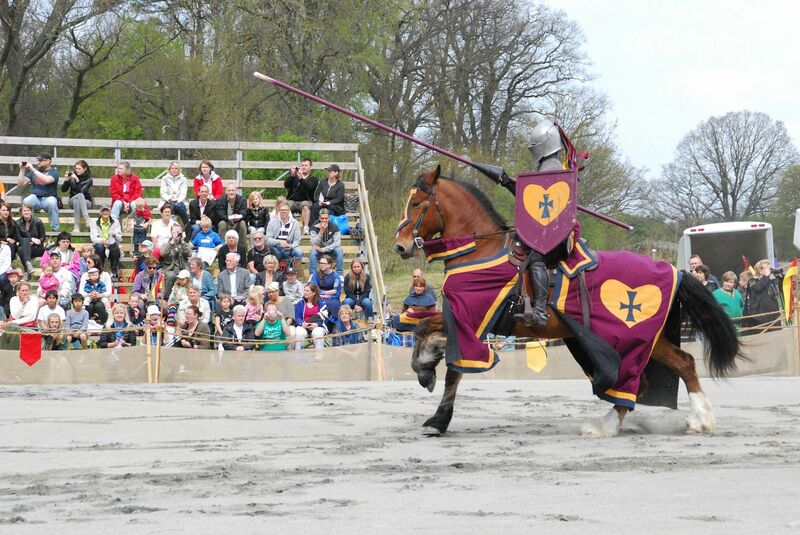 There are at least 10 different associations in Sweden for jousters who train together in order to put on tournaments at medieval markets, weddings and as independent shows. Many years ago, these groups worked together to create Svenska Riddarsällskaps Samarbetsgrupp(the Swedish Jousting League) to set up rules and standards for a Swedish Championship Jousting Tournament. 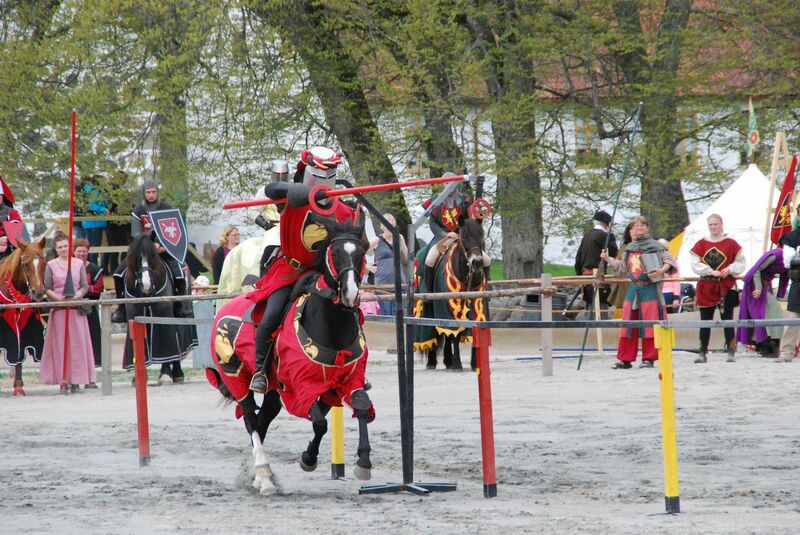 The main purpose of Svenska Riddarsällskaps Samarbetsgrupp(SRS) was to improve the quality, riding skills and equipment used in jousting, and to create a forum where different topics could be discussed, such as safety issues. Since the creation of this league, there has not been a championship every year. 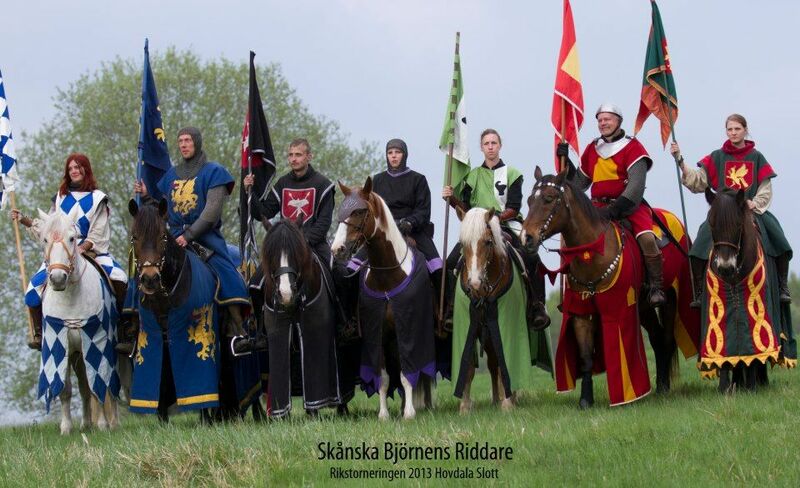 However, Rikstornering 2013 was the 14th official Swedish Championship Jousting Tournament. In all of Sweden there are a total of about 100 jousters. 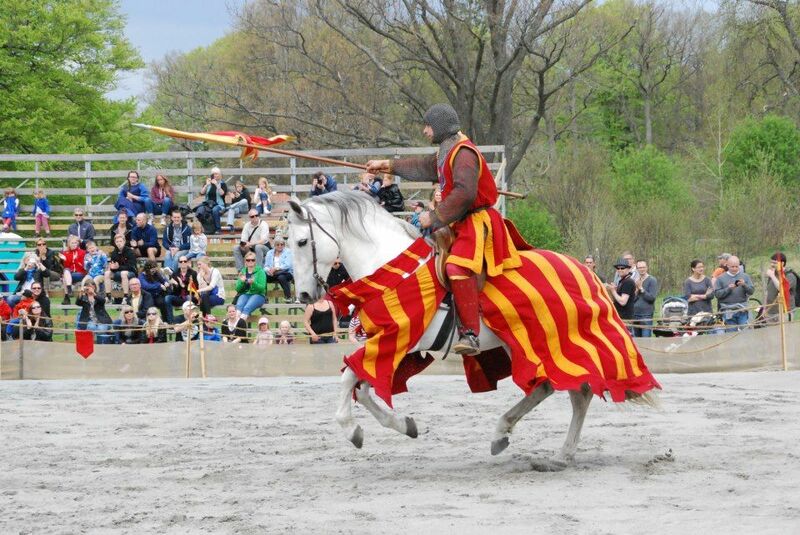 However, since this was the championship, only the most skilled jousters competed, making it a true championship. 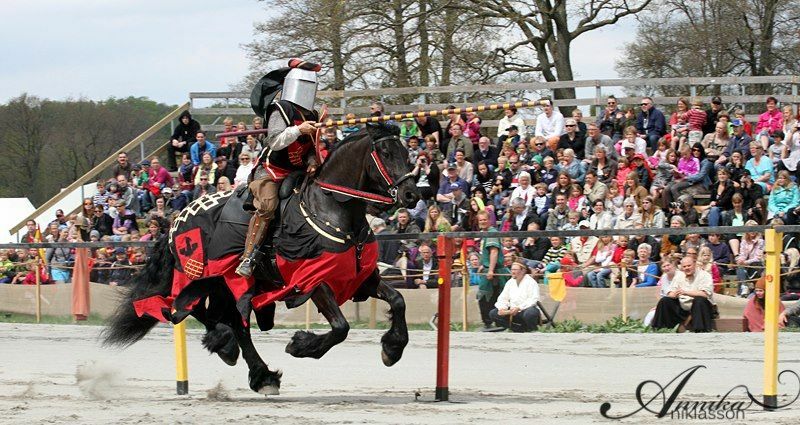 There were a total of 45 jousters who competed at Rikstornering 2013, which was held at Hovdala Castle in the south of Sweden – the same place the championship was held last year. Hovdala Castle is a fantastic place to hold a tournament because it is in a area without modern houses. During the two days of last year's tournament, there were more than 12,000 visitors, and this year there were even more. At the same event, there were also a variety of reenactment groups as well as a medieval market. The most well known group in Sweden that is doing European style tilting [in plate mail with an ecranche and frangible lances] is Celeres Nordica which international jousting champion Klas Lundberg is a member of. This year's tournament mainly consisted of three different competitions: Mounted Skill at Arms (Swedish version) [MSA – Combined Course] and Swedish Mounted Tournament – where you ride from both sides at the same time – which was performed as both an individual and as a team competition. Additional prizes were also awarded to the Best Herald, the Best Youth (age 18-23), most handsome jouster with horse and the most chivalrous jouster. There were no serious accidents or incidents. The horses were in good condition and were inspected by a veterinarian in the mornings. The Swedish version of Mounted Skills at Arms is riding a course as fast as possible while hitting all the targets with different weapons (lance, spear and sword). It is maximum speed and gallop all the way. If you miss a target you receive a penalty of 10 seconds. The first day was a qualification round, and finals were held the next day. The winner was Anders Larsson(Kunskapens Riddare/the Knight of Knowledge) from Torneamentum, who had a clear round and an extremely fast time of approximately 1 minute and 15 seconds. Second and third place also went to jousters from Torneamentum: 2nd place - Daniel Utas(Riddare Hans af Wisby) 3rd place - Kristian Utas(Riddar Tjelvar). However, the results of the finals were all very close except for Anders' winning run which was outstanding. The first day was a qualification round with finals held the second day. Swedish Mounted Tournament consists of six different parts where pairs of jousters ride with a variety of weapons aiming for different targets. 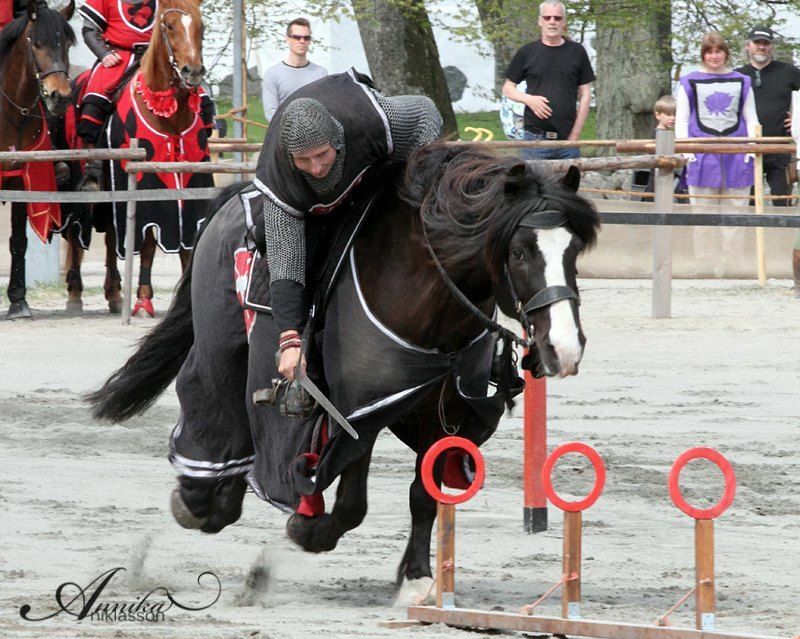 In the Swedish Mounted Tournament individual competition, a jouster from Torneamentum again won first place, Jan-Erik Utas(Riddare Bagge/Knight of the Ram). 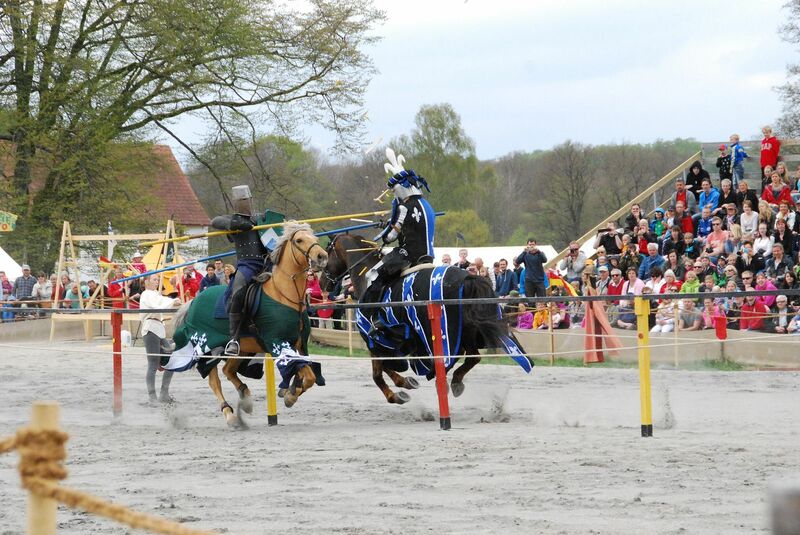 Second place was also won by a jouster from Torneamentum, Fredrik Strange(Tidernas Riddare), and third place was won by a jouster from the group Infensus, Pontus Persson(Riddare Lejongap). In the team competition Torneamentum won first place. Second place was earned by a team from Arboga Raedarius. In third place was the second team from Torneamentum, and in fourth place was a team from Skånska Björnens Riddare. Torneamentum is the most well known jousting group in Sweden. They live on Gotland Island, and they have won most of the Swedish Championship Jousting Tournaments, however it was a lot harder for them to win this year than it used to be. The Best Youth, Joanna Varde(Riddare Vingfåle), and the Best Herald, Dennis Augustsson, were from the group Skånska Björnens Riddare. The Most Handsome Knight (visitors’ choice) was Jan-Erik Utas (Riddare Bagge / Knight of the Ram) from Torneamentum, and the Most Chivalrous Knight was Carsten Nihlen (Den Skånska Gripen / The Scanian Gryphon) from Arboga Raedarius. 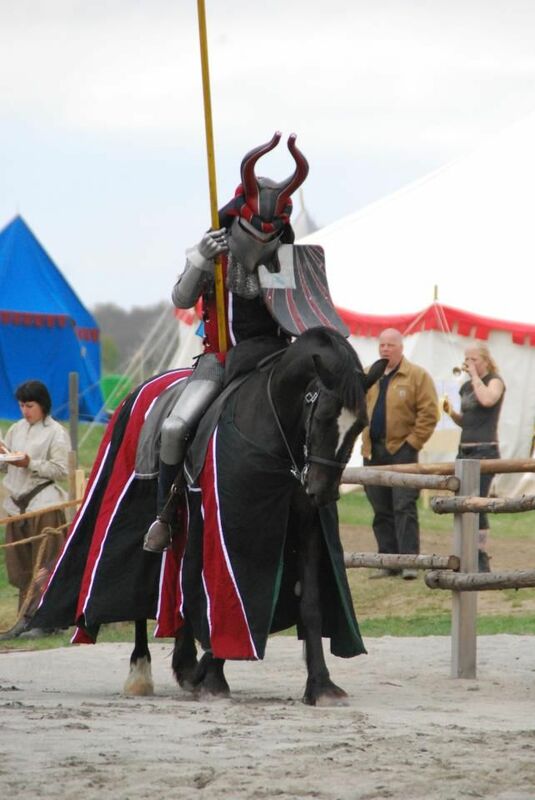 In addition to the competitions, members of the jousting troupe Celeres Nordica also performed a demonstration of “normal” jousting or as we say “Man against Man” [plate armour jousting with ecranche and frangible lances]. The tournament lasted two long days with constant competitions running 8 hours each day. At the end, we had a parade with all the 45 jousters riding in procession, and of course a banquet where we spent the whole night celebrating. In the future it might be fun to also have international jousters visiting us or performing demonstrations during the tournament. 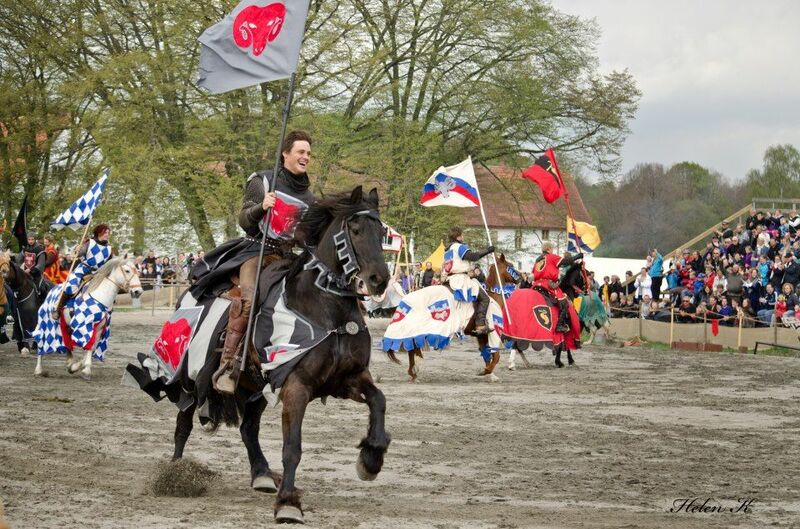 You can see more pictures of Rikstornering 2013 in The Jousting Life's Rikstornering 2013 photo album on Facebook.